A slow burning game at the San Moix, the game eventually delivered some excitement following the only goal of the game in the 74th minute. With both teams harbouring aspirations of pushing towards the top ten, this game offered much yet failed to deliver with only sporadic moments of guile intersped amidst a midfield battle. Whilst Sociedad may be disappointed by the result, their lack of ambition has ultimately cost them and saw Mallorca briefly mount the summit of La Liga. The shape of Sociedad was the most interesting feature but they never used their superiority in key areas, always too content to take the safe option. Mallorca delivered a performance, in the second half at least, that you would expect from a side managed by Joaquin Caparros. Caparros made one change to the side with Conceicao replacing Bigas in central defence. Giovanni Dos Santos signed prior to the transfer deadline but was not eligible to play. Mallorca lined up in Caparros’ favoured 4-4-2 with an emphasis upon the wingers to push forward and supply the two strikers with crosses. Montanier made one change to the Sociedad line up with Griezmann dropping to the bench to be replaced by canterano Ruben Pardo. With such a poor away record last season, La Real only managed three away wins all season, it was expected to see a more cautious Sociedad in away fixtures. 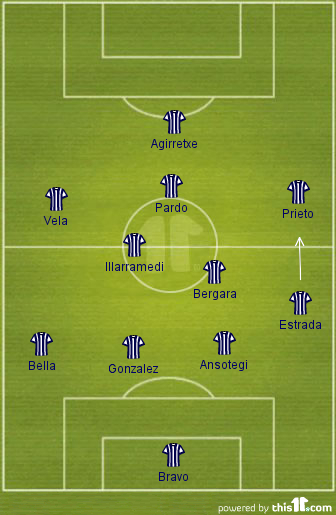 Although notionally a 4-5-1 formation, Sociedad offered great flexibility and the system was something more akin to a 3-4-3 when attacking yet the team was sadly never as adventurous as the numbers on the paper has promised. Sociedad started brightly in the first half enjoying greater territorial advantage but seldom created any genuine scoring opportunities. The chance for Agirretxe from a free kick in the opening minute of the game was arguably their best opportunity of the half, spurned with a misplaced shot. The key for Sociedad enjoying greater territory in the opening period was their numerical superiority in the centre of the field. Despite being the notional right back, Estradra pushed very high which allowed Pardo and to a lesser extent Xabi Preito to move slightly infield. Yet on the few occasions when Bella Donna advanced on the left, Estrada would drop back to maintain a solid defensive trio for Sociedad. This had two effects on Mallorca. Firstly, the overload of players pushed Michael Pereira further back reducing a key attacking threat from Mallorca. Secondly, the numerical advantage in the centre of the field forced Pereira and Nsue to tuck in and provide support for Marquez and Pina. 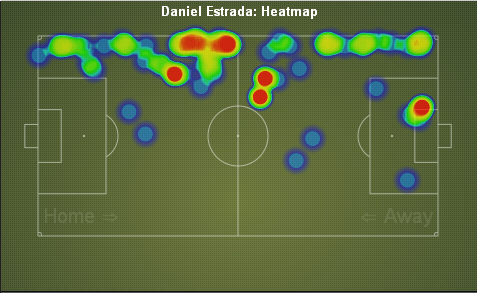 This left the wings open for Sociedad to use hence Estrada pushing very high. Yet Sociedad failed to craft any chances and as the half wore on, Mallorca slowly began to exert more pressure on their opponents defence but the game as a whole was bogged down in a midfield battle. Sociedad dictating the tempo, content to play slowly whereas Mallorca always seeking to lift the pace of the game. 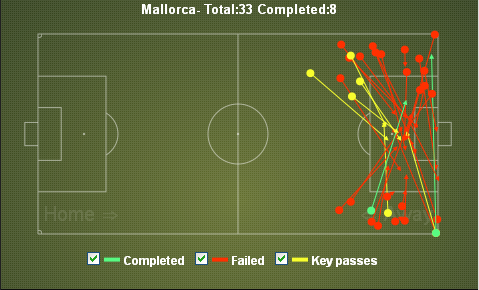 The diagram below shows the number of crosses attempted and completed by Mallorca in the opening 45 minutes. With Pereira and Nsue either central or deep, Mallorca were unable to develop their own game and pressure Sociedad to any extent. Too often the cross was delivered in advance of the penalty area and so was easy to defend against. The first real opportunity for Mallorca was in the 18th minute when Hemed’s cross was met on the volley by Pereira and flew over the crossbar. With Mallorca taking the initiative and Sociedad moving back, the midfield pairing of Marquez and Pina were no longer outnumbered as Prieto stayed on the right and Ruben Pardo’s influence on the game disappeared. Sociedad were now a conventional defensive four. 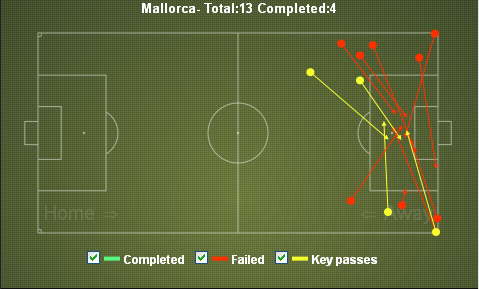 With Pereira and Nsue committing their opponent, Mallorca were moving further forward before crossing the ball. Sociedad moved further back towards their own goal as the second half wore on whether this was by design or due to the higher energy game by Mallorca is open to interpretation. With such a poor away record, it seems likely that Montanier became too conservative and aimed for a point rather than have the necessary belief that all three points were available. The only goal of the game arrived in the 74th minute and it should have come as no surprise to see it arriving via the head of Victor from a Javi Marquez cross from a relatively deep position. Marquez had time to examine his options before flighting the ball forward to Victor. A good three points for Mallorca and one which showed the side implementing the tactical plan of Caparros in the second half. The aggressive and direct style which he favours and which has proven successful before. The acquisition of Javi Marquez and Antonio Lopez look shrewd and it’s difficult to see this Mallorca side even flirting with relegation this season. For La Real, two away games and two defeats already but a lack of belief within the side as the second half wore. Montanier’s pan created problems for Mallorca in the first half but it was never built upon and despite the superiority in midfield, there were too few options in the final third. Sociedad wanted to play the game slowly and safely in the middle of the pitch. It was never going to be like that for 90minutes against a Caparros side.